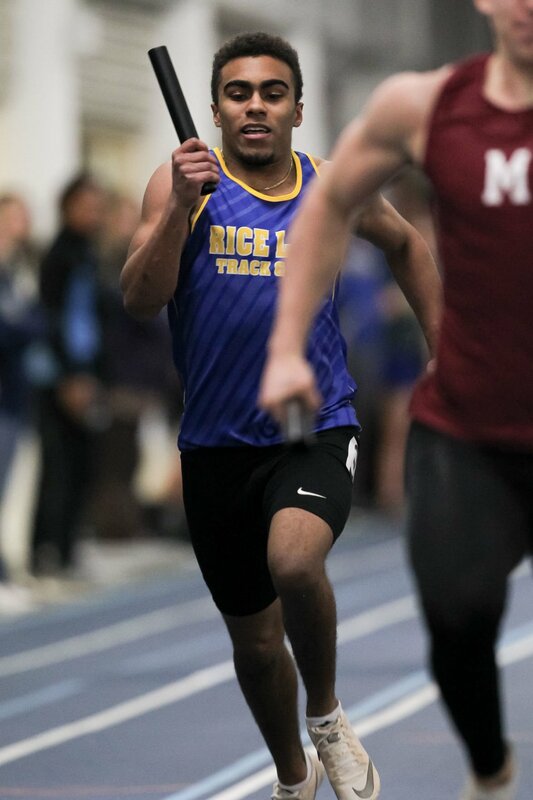 Rice Lake’s Marquez Clerveaux runs a relay at the Big Rivers track meet on April 2 at UW-Eau Claire. Rice Lake's DeAirus Clerveaux (bottom row, far right) and Marquez Clerveaux (second row, fifth from the right) pose with the trophy after winning the Division 2 WIAA track and field state championship at UW-La Crosse on June 2, 2018. The name is Clerveaux. It’s Haitian, and it belongs to Rice Lake stars Marquez and DeAirus Clerveaux. The boys have never known life the Caribbean. They know the safety of northwest Wisconsin, the kind of safety that their father, Jackson Clerveaux, said attracted him to the area. Jackson grew up in the Bahamas, living what he called the “island life.” His family, Haitian immigrants, lived on a farm, raised animals, grew their own food, and rarely needed to go to a store. Then, in 1982, that all changed. He remembers quickly packing up his clothes and leaving everything else behind before boarding a plane to Florida. At the time, he said the Bahamian government was detaining and deporting all Haitian nationals. Though he and his brothers and sisters were all born in the Bahamas, his parents were not and they feared being taken away. Jackson’s sister, Clarice Clerveaux, believes the Bahamian government’s treatment of Haitians was, and continues to be, “100%” discriminatory. The Cleveraux family was torn apart. Only Jackson, two of his brothers, and his father managed to make it to Florida. His sister, one of his younger brothers, and his mother were detained and sent back to Haiti. There, they lived for two years under the ruthless regime of president Jean-Claude Duvalier before they were able to move to Florida. In Fort Lauderdale, Jackson’s life changed dramatically. He remembers getting picked on because of his accent. Over time, he began to assimilate. Part of that came with finding a love for football. He remembers turning on the TV one Sunday afternoon and watching Joe Montana’s 49ers take down Dan Marino’s Dolphins. From then on, he was hooked. It was a love that allowed him to move to Wisconsin, where he played football at Mount Senario College in Ladysmith before transferring to UW-Eau Claire. After college, he played in a Wisconsin semi-pro league for the Madison Mustangs. There, Jackson said his boys, Marquez and DeAirus, developed their love for football. This past season the boys led the Warriors to a 10-3 football season, totaling 29 combined touchdowns, rushing for over 1,500 combined yards and adding another 750 through the air. They both made Big Rivers all conference teams, with DeAirus a first teamer and Marquez on the second team. Despite being two of the best football players in the area, track is what they’re truly great at. This season should be their coming out party. For years they waited behind Rice Lake star Kenny Bednarek, but this year, it’s their time to shine. And this year, they should be. Marquez was the highest-finishing underclassman at state last year in both the 100-meter and 200-meter races. DeAirus tends to run the longer races, finishing third at in the 300-meter hurdles last year and has already taken the top spot in the 400-meter three times this spring. Just because they don’t often compete head-to-head doesn’t mean they aren’t competitors. “We kind of go back and forth with points to see who can score more points at the meets,” DeAirus said. Marquez believes having a brother to push him has made him better. “I don’t want to lose to him, so I go hard,” he said. For their father, the races are nerve-wracking. “I get butterflies all the time,” Jackson said. He rarely gets to see his boys race because he works on the pipeline in West Virginia and is away for months at a time. Jackson is off for a few months now and said that he should be able to see his sons race during their final high school track season. “I’m real proud of what they’re doing,” he said. After state, the boys will be off to college. They already have multiple offers they’re mulling over, but before the world find out where they’re heading, maybe it’s worth understanding where they’re from.